Especially meant for hikers, riders and outdoor workers, it combines a 10.1- inch IPS HD screen, a quad-core processor, 1GB of RAM, 16GB of internal storage, and 2 cameras, a built-in GPS and USB Type-C / micro HDMI slots, all in a rugged casing. From drops to water splashes, electronic devices damaged at home have cost families billions. At the same time, rambling has never been so hype and hikers or riders want their tablet in their backpack. Even outdoor workers are looking for robust cutting edge technology to increase their productivity on the field. IPS HD 10.1" Screen: The 10.1-inch IPS HD (1280 x 800) screen of the ARCHOS Sense 101X is ideal to surf the web on the go. 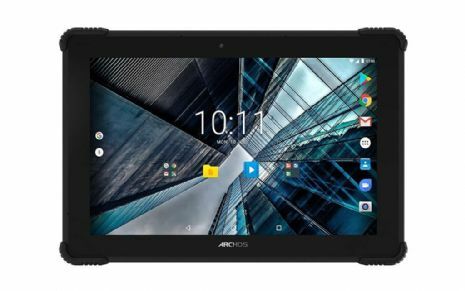 Rugged Tablet: The ARCHOS Sense 101X is for anyone out there: whether you need a rugged tablet for outdoor work or you just need a tablet you know you can on, this one will do the trick running on Android Nougat. Durable, Reliable, Built to Last: Go on an adventure without fear, with the ARCHOS Sense 101X! The ARCHOS Sense 101X is made for even the most reckless: it is splash proof and shockproof. Quad-core processor: For a smooth and ultra-reactive experience the ARCHOS Sense 101X is powered by a quad-core processor. Front and back cameras: Capture what's important to you with the front 2MP and back 5MP cameras. Micro-HDMI output Thanks to the HDMI port on the ARCHOS Sense 101X you can get your content up on the big screen, whether it's a YouTube video, a game or content made on the tablet, anything can be mirrored to your TV screen. Sign up to our newsletter for all the latest news and offers from GO Rugged.